The last time we had the pleasure of exhibiting Clare’s work she was exploring the City as landscape. She described its form and colours and showed the city as a place inhabited and shaped by the people that populated it. 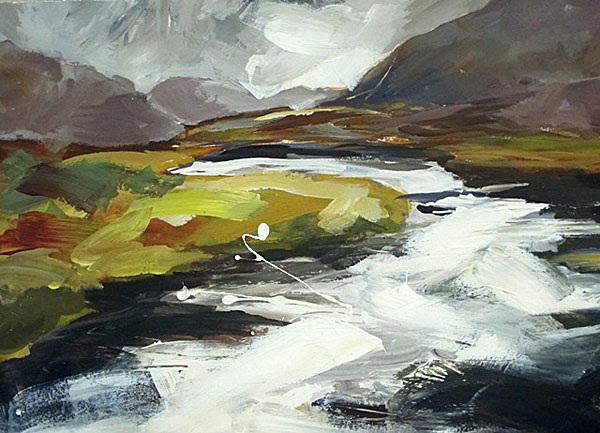 In this exhibition of new works, Clare has retuned to the purity of a landscape owned, formed and cared for by nature. This latest collection of landscape paintings is a result of Clare’s rambles around the British Isles in her campervan/mobile studio. From the far north of Scotland to the west of Ireland, from Northumberland to Co. Kerry, it reflects her love of these islands of her birth. The work seems to be predominantly about colour; colour as mood and emotion, while being distinctly about the place. This centrality of colour has come about more by instinct than by a thought out decision, part of the process of Clare’s evolving work. When not in her campervan Clare is based in Liverpool, working out of Hub Studio, in the Northern Lights building in the old Cain’s Brewery.